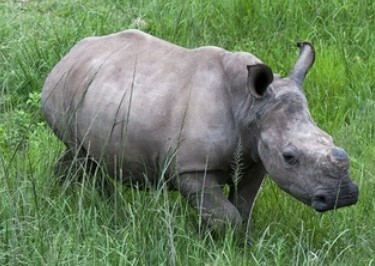 Baby Rhino Olive at Baby Rhino Rescue | Adopt and Donate Now! Olive arrived at Care for Wild Africa in November 2013. She was ten months old when her mother was shot by poachers. Olive comes from the Sabi Sands Nature Reserve. She is a beautiful, young teenager now, with the true feistiness of a teenager! She likes to make a statement. She is a powerhouse and volunteers have to be confident when dealing with her. Olive is the rhino with attitude. When the volunteers come to the fence with milk, Olive will run toward them, head up, tail up and dominant. She is not too interested in interacting with people and is known by the volunteers as “a toughie.” If volunteers come into her boma enclosure, she has been known to charge! Olive knows her place in her small herd. She is always in the middle, the place where she is happiest. When the rhinos go out into the bush to graze, she will always lead Forrest and follow Timbi and Hawk. Olive spends nights in the comfort of her night pen, sleeping side by side with the three rhinos who are her family now. And during the day, Olive wanders in the beautiful outside area, eating grass, having mud baths and lying in the shade of the acacia trees in the hot, afternoon sun.